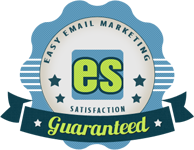 We believe all small businesses should have an email marketing system that is easy to use. Use it for FREE while your business grows! Your Edge Sender account will remain free until you start sending campaigns to more than 5 people, or start up an autoresponder. Our template builder allows you to easily design a beautiful email template in just 5 minutes. Choose from a range of layouts, add your logo and tweak the colors. Then add your own text, links, images and advanced content like social sharing and personalized content for each subscriber. It's the easiest email editor you've ever used! 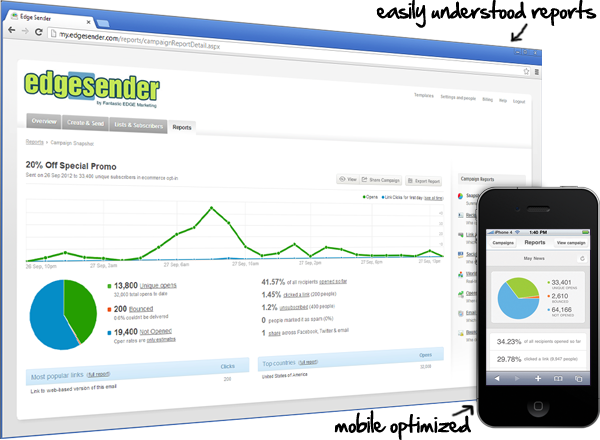 The advanced feature set includes Autoresponders, RSS-to-Email, Social Sharing, and Automatic A/B Testing. Our segmentation and personalization tools make it easy to focus your efforts where they count most, so you can be sure you're getting the right message to the right person at the right time. Every time you send a campaign we provide a beautiful set of real-time reports allowing you to see who opened it, what they were interested in, who they shared it with and much more. The Subscriber Snapshot shows a single page where you can see every open, click and share in the life of that subscriber. We make it easy to grow your list by adding a signup form to your own site or Facebook page, and take away the headaches of managing a list by handling subscribes, unsubscribes, and bounces for you. Our social sharing feature makes it easy for your subscribers to share your campaigns on Twitter and Facebook. With a single click you can add a "Like" or "Tweet" button to your campaign and it's ready to be shared. Mobile-email usage is skyrocketing as smartphones spread through the consumer market. Around 40% of people in the U.S. read email on a mobile device. That's why we programmed our template builder to automatically create a version of your email already optimized for mobile devices. Edge Sender is an email marketing service provided by Fantastic Edge Marketing, empowering you to easily create, send, and share successful marketing campaigns. I think we see real results with the emails. I am starting to get some members back now that previously canceled because we have been in their inboxes with our newsletter!! I have used your tool for the first email campaign yesterday and I must tell you it was simple, easy, and quick. Well done! This is definitely the easiest to use emailing software. I can access it on any computer, which helps when I’m out of town. Edge Sender delivers the rare combination of being easy to use and offering massive functionality.